He stood tall for using a cane. Especially when the military band pounded out the first few notes of The National Anthem beneath hazy spring sun. I watched him hike up his shoulders a little taller and salute the flag billowing in the warm May breeze, three of his friends all displaying badges of honor across their chests and sporting military hats over grayed hair. It was the first time shivers ran up and down my spine, the first time I realized what it meant to live beneath the shadow of the American flag, one I'd spent so much time being embarrassed by as I walked European streets or rocked out at punk concerts. After the ceremony ended, I walked my reporter-in-training self over to those men, pen in hand and asked them to share with me their stories. It was the longest, best interview of my reporting career, maybe my life so far. We stood there together as they divulged their memories and experiences and hearts with a 21-year-old punk who raged against the man without ever really pondering that my freedom to rage was granted by the men and women who gave their lives to their country, my country. I was probably around your age when I left the states for my tour, one of the veterans had said. I lost a lot of friends ... a lot of my friends died so young for this country ... it changed me. I walked away from that interview changed, too, gratitude injected into an ignorant heart. And since I've found myself with tears in my eyes when I see the flag waving and dancing in the air, hear the notes of the anthem or see the uniform-clad bodies of our service people; freedom comes with a hefty price tag, one I'd only remotely experienced through story that day. 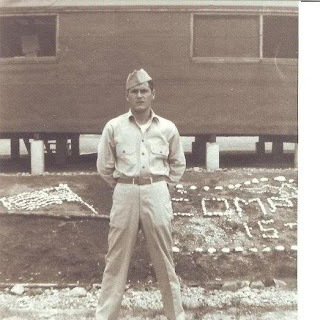 After that, I'd always made it a point to call my grandfather, who served in World War II, on both Memorial Day and Veteran's Day, because I wanted him to know on both days I recognized his service and the service of the men and women he served beside who never came home to their families; I wanted him to know I was grateful. He always said thank you but brushed it off as having simply just done what was needed. But I know his time spent serving changed him. My grandfather during World War II. Photo courtesy of my aunt. My grandfather passed away six months ago, leaving the world short of the dwindling few World War II veterans who came home after the war. I watched the flags atop of the mailboxes dance and wave this morning in the breeze and missed him. My mind wandered to those men I interviewed all of those years ago, too, curious if they still stand at the ceremony year after year, showing their respect and appreciation for the fallen while demonstrating what it means to stand tall in gratitude to younger watching eyes who have taken our daily lives here in the land of the free for granted. A sense of urgency took over in my heart to share with my own little ones in my house why we slow down today and remember. There are curious eyes here in my house, wide open and watching. I wanted to take them this morning to see the faces of those who have taught us with their lives what it means to live with gratitude, but they wanted to dig in the dirt with grandma and fish in the lake. I was frustrated at first, driving alone to the ceremony, thinking about how I wanted them to soak up even the smallest understanding, grow the tiniest bud of appreciation for the freedom they enjoy. At the ceremony, though, as I listened and prayed and thanked God for the people who have served, I remembered that freedom affords us choices ... from the freedom of speech and religion and bearing arms ... all the way to the freedom to stay home on Memorial Day and dig in the dirt or fish in the lake when you're 5.5 and 3.5 years old. Their days of realization will come. There will be faces who embody the very essence of courage and freedom. What it means to walk in the shadow of the flag, just like the one of the cross, and the freedom each affords will come into the light one day for each of their hearts. And they, too, I pray, will walk away changed. Oh, they will get it in time I am certain. They will see its importance in you and that will pique their interest. They will watch and listen and in that way you will pass along the reverence for the day and the heroes that you hold in your own heart. The teaching of what is important, and what is true is such a tremendous gift and responsibility we parents are given, isn't it? I've no doubt you are up to the challenge.